The Icefields Parkway is 242 kilometres (144 miles) of sheer beauty between Jasper and Lake Louise. You could travel it in 3 hours, but the guidebooks say to allow much more time for pulling over at viewpoints. When we traveled through here as college students, we never stopped, but just admired the scenery flashing by. Now, much older (and hopefully wiser), we pull over and stand in admiration at creation's majesty. 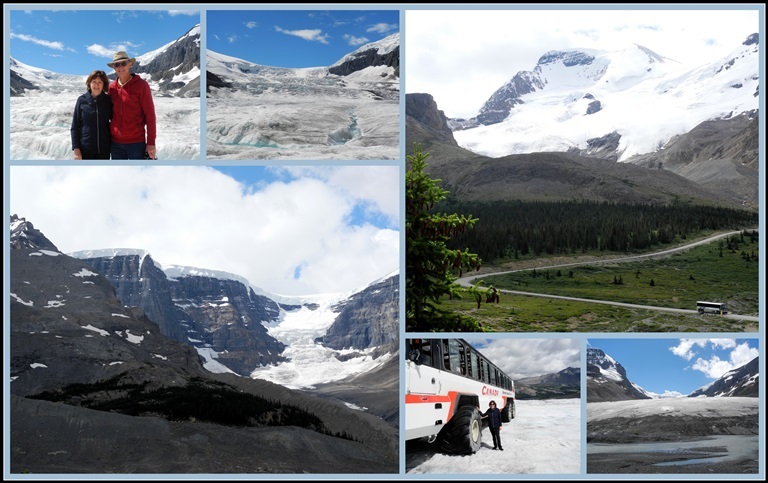 On this latest trip, we splurged on a guided expedition to Athabasca Glacier, part of the vast Columbia Icefields. The glaciers are receding - we notice the difference from our youthful travels - whether by natural climate change or human cause and effect is something I'm not getting into here. Our excursion took us by coach bus from the Icefields Parkway Center to a parking lot above the treeline where we transferred to a SnoCoach - a large-wheeled bus (built in Calgary) especially designed for travel on the glaciers. There are 23 of these buses, 22 here and one in Antarctica. While it was fun to walk on the glacier, next time, we would take a guided walking tour so we can explore more. The large, lower left photo shows the Ice Dome and the Dome Glacier. This the world's only triple continental divide, where water melting here flows to three oceans - the Pacific, the Arctic and the Atlantic (by way of Hudson Bay). Just one more mountain - Mt. Edith Cavell - here with her cap on as befits a nurse of her time, and one of the very few mountains named for a woman. I first read about Edith Cavell in Grade 3 or 4, in a book about nurses I received as a gift. A British nurse during the first World War, Miss Cavell helped soldiers of both sides. She aided over 200 British soldiers to escape and for this she was arrested for treason and shot by firing squad. She freely admitted to the court what she had done and said, "I cannot stop while there are lives to be saved." Rather a long post for Mosaic Monday - guess I'm feeling wordy this morning. I hope you all have a wonderful week. Thanks for visiting my blog. I had no idea that there was a mountain commemorating Edith Cavell. What a brave lady she was. I've always wanted to splurge on the ride - you must have had a grand day! Oh I still remember Edith's story myself and how, as she was led to her execution, she requested the old hymn "Abide With Me." What a beautiful, grand mountain to be named in her honor. Now that I am old, I would happily skate on past the ice fields as you did when younger. I'm not getting any wiser I'm afraid, though they are a wonder of the world lovely to see. Thank goodness for my blogging buddies! Fabulous photos, what a wonderful trip. I had not heard the story of Edith - it is sad to think of the loss to the world. Wow, gorgeous mountain scenery and the glaciers are beautiful. I would love to visit this area, it is on my bucket list along with Lake Louise. Lovely photos, thanks for sharing your trip! Enjoy your week ahead! It sounds like a wonderful trip and you needed a coat! Sounds good to me! Beautiful photos ! Come link up with us today for Travel Photo Mondays, the link is open all week. What a beautiful place to visit. And interesting about the history of the mountain in the last photo. What strength in a woman! This scenery is just SPECTACULAR! Your pictures really are lovely, and I really enjoyed the story of Edith Cavell. What an honor to have a mountain named after her, but so sad that she was executed for saving lives. It looks like you and your husband had a wonderful trip through the Canadian Rockies. Thanks so much for sharing with us and have a wonderful week! Wonderful mosaics! And I am fascinated by the fact that there is a three-way continental divide...I had no idea! Fascinating story of Edith too. Wow...that really looks amazing. Thanks for the story of Edith! Beauiful scenery to drool over. Nice shots. Thanks for sharing them and your trip with us. Seeing them helped cool me down a bit - heat index of 100 and high humidity out there. Beautiful images. It would be amazing to see a glacier. The story of the British nurse was heartbreaking. How could such an honourable person be shot? I am glad there is a mountain named in her honour. Interesting...the story behind Mt. Cavell. We drove the Ice Fields Parkway for the first time in June. So beautiful! We made several stops...but never had time to visit the Columbia ice fields. Next time! You have captured some great photos this summer Lorrie! Thanks for sharing them with us all! Hope you will stop by the country for a peak at our before and after . I am finally getting some pictures organized from our reno projects in our new place. Have a great week!